Ultrasonic Additive Manufacturing (UAM) is an additive manufacturing technique based on the ultrasonic metal welding of flat metal foils and computer numerically controlled (CNC) contour milling. 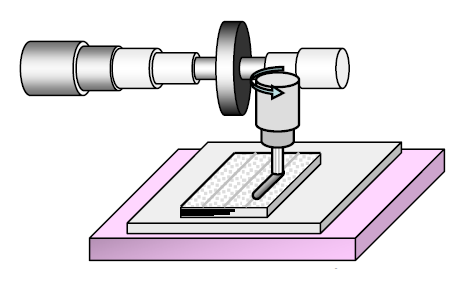 Each foil layer is ultrasonically bonded to the underlying foil layers (figure 1a). Because the width of the horn's welding face is generally less than the width of the foil, the horn must make multiple adjacent passes over the foil in order to completely weld the entire foil surface. Then CNC contour milling is used to create the desired shape for the given layer (figure 1b). This process is repeated layer-by-layer until the final part has been created. This allows parts with complex internal cavities and parts with multiple materials. The foil is held stationary while the horn rolls across it (rather like using a rolling pin on pizza dough). 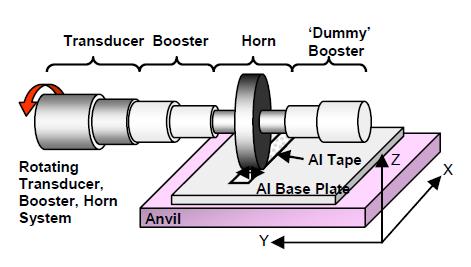 The horn's position is fixed while the foil is supported on a platform that moves beneath the rotating horn. White patent 6,457,629 B1 — "Object Consolidation Employing Friction Joining"
White patent 6,814,823 B1 — "Object Consolidation through Sequential Material Deposition"
Graff patent 9,346,120 B1 — "Sonotrode Apparatus for Use in Ultrasonic Additive Manufacturing"